Despite the lackluster performance of AMD’s recently launched FX series, AMD’s first APU of the year is still going strong. The Brazos based T56N, an E-350 for the embedded market, has popped up in a new system from WIN Enterprises aimed at casino gaming applications. The PL-80330 is being announced today along with its little brother the MB-80330, a motherboard only version. Both offer the standard list of features you’ve come to expect from an APU based platform. Ranging from DirectX 11 and OpenGL 4 support, to decoding capabilities for H.264, MPEG2, and Blu-ray 3D; things appear pretty normal here. Where the PL-80330 really sets itself apart from your standard Brazos box is in its port configuration. Sporting dual LAN ports, a pair of DVI ports, and a couple of COM ports on its back panel, the PL-80330 offers support for up to 10 COM ports in total. 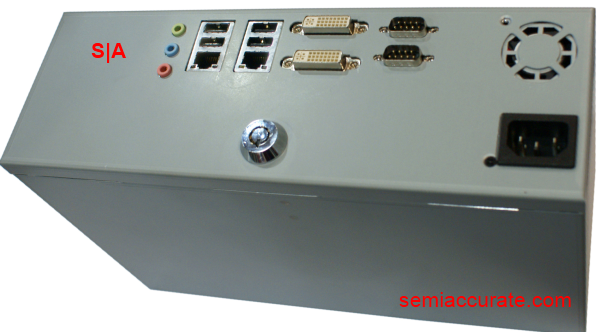 In addition to industry specific port configuration, one of the key selling points of the PL-80330 is the security it offers. It has physical security in the form of a lock on the outside of the unit, in addition to some vague software and data security defenses. But probably the most secure feature it has to offer is its support for both Windows XP Embedded and the far more secure operating system, Linux.